2.4GHz 6dBi Omnidirectional outdoor antenna - 11.5 inches (29cm) tall with female N connector - great for hotspots RB/800 RB800 Mikrotik RouterBOARD 800 with MPC8544 800MHz CPU, 256MB DDR RAM, 512MB NAND flash, L6 license - New! 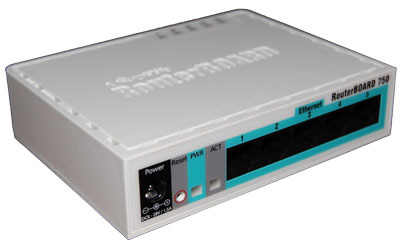 Mikrotik RouterBoard RB/800 RB800 complete Extreme Performance Router with 3 - 10/100/1000 ethernet ports and 4 miniPCI slots and RouterOS Level 6 - New! AC/SWI-MMCX ACSWIM 2.4-5.8 GHz 2.5dBi/5.5dBi Omnidirectional Swivel Antenna with cable and MMCX connector (for indoor use) Mikrotik RouterBoard RB/1100 RB1100 complete Extreme Performance Router with 13-10/100/1000 ethernet ports and RouterOS Level 6 license - EOL Mikrotik RouterBoard RB250G RB250GS Smart Gigabit Switch with five-10/100/1000 ethernet ports and SwOS - New!